Movies Missing from Netflix? Blockbuster? What movies are missing from Netflix? What would you like to see on Watch Now? What's missing from Blockbuster Online? We hope you're enjoying BLOCKBUSTER Total Access™! There are some changes to our subscription plan lineup that introduce a new pricing structure and new plans which limit the number of in-store exchanges. As a result, your current plan will no be longer be available at the current price. We'd like to extend you a new plan that includes Unlimited DVDs 3 at a time plus up to 5 free* in-store exchanges for $17.99. Looking at your recent activity, we notice you only average 4 in-store exchanges each month, so this new plan should give you all the in-store rentals you need. In addition, on August 1, we will be introducing discounted in-store movie rentals for any additional movies you might need above the in-store exchanges included in your plan. Your new plan will go into effect on your regular monthly billing date following August 30, 2007. If we don't hear from you by August 30, 2007, we will automatically move you to the new BLOCKBUSTER Total Access plan referenced below as "Your New Plan". It looks like Blockbuster will be moving customers to the limited plans as fast as possible, due to the high cost of unlimited in-store exchanges. Has anyone else received a similar e-mail from Blockbuster? The AP is reporting that Blockbuster will be testing smaller stores, Blockbuster to Test Smaller Stores. Keyes, former CEO of 7-Eleven, said Blockbuster will test smaller stores in the next few months. The company may look at kiosks and mixed-use locations that can accommodate a 1,500-square-foot store. "If you satisfy 98 percent of customers with half of the inventory we have today, then we could satisfy that demand with a 1,500-square-foot store and lower our rent and operating costs and create efficiencies," Keyes said. "I'm hoping to offer even more depth in the new releases without necessarily the breadth ... in the traditional movies," he said. The company is mulling scaling back on additional store closures, while testing several large store format alternatives that feature a combination of rental and retail products. A sophisticated and unique comedy series, "Californication" centers on writer Hank Moody (Duchovny), who struggles to raise his 13-year-old daughter (Madeleine Martin) while still carrying a torch for his ex-girlfriend Karen (Natascha McElhone). His obsession with honesty and self-destructive behavior -- drinking, drugs and relationships -- are both impeding and enriching his career. Originally reported by Video Business. Who Owns Your Movie Rating & Reviews Data? This is a long-told tale here on Scripting News. 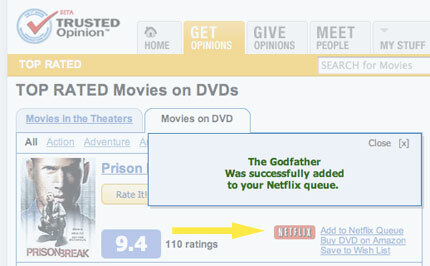 The classic example are the movie rating data held in silos by sites like Netflix and Yahoo Movies. But whose data is it?? Seems it belongs to the users and they should be able to take it where they want. Sure Yahoo is providing a recommendation engine, that's nice (and thanks), but they also get to use my data for their own purposes. Seems like a fair trade. And I'm a paying customer of Netflix. They just lowered the price but I'd much rather have gotten a dividend in the form of being able to use my own data. Think of the mashups that would be possible. Wouldn't it be great to link up Match.com with movie ratings to find dates that like the same movies? Some of my Netflix Friends have rated thousands of movies, written scores of reviews, and have hundreds of movies in their queue. This data has a lot of value to these people, and there should be a way for customers to backup or transfer this information into other services. While it doesn't make sense for Netflix or Blockbuster to do this, it's a good opportunity for a third-party developer. I'm also surprised Blockbuster hasn't figured out how to import a Netflix queue yet. Cinematical: "It has just been a week since Ulrich Mühe died, and the film world is now suffering the loss of more talent. Nine-time Oscar nominee and Irving G. Thalberg Memorial Award winner, Ingmar Bergman, died today at the age of 89. One of the biggest directorial names of the 20th century, Bergman rose to fame after a challenging and painful childhood, and used his experiences to carve directorial success "in the way a dream transforms experience and emotions all the time." You can view a list of all of the Bergman movies that Netflix caries online here. What was your favorite Bergman movie? Click here for the full list of new releases this week (84). Interesting movies include 300, Hot Fuzz, Pathfinder, Lonely Hearts, The Darwin Awards, Starter for Ten, and Roving Mars. Trusted Opinion Enables "Add to Netflix Queue"
Trusted Opinion, a social networking site with a focus on recommendations, has added a nifty trick that lets you automatically add movies to your queue with one click. Netflix doesn't publish an API for adding movies, so they must have figured out a hack to make this work. A reader sent in the following e-mail he received from Blockbuster regarding the price change. The date on the E-mail was the 27th, a full day after the deadline for changing plans. We want to let you know about some changes to our BLOCKBUSTER Total Access™ subscription plans. This information is provided for your reference only – your subscription plan will not be affected by these changes. Beginning July 26, 2007, there will be a price increase on your current unlimited plan. We will also begin to offer plans which limit the number of in-store exchanges available each month. As a preferred customer, your plan will not change at this time. Please continue to enjoy your exclusive subscription plan, including no monthly limit on free* movie rentals or discounted game rentals when you exchange in-store, at today's price – far below the published rate available to new subscribers. At any point, you can log in and review your current subscription plan or see all available plans. Keep in mind that if you want to change your subscription plan at any point after July 26, 2007, your new plan will be subject to prices and terms available at that time. Please don't hesitate to contact us if you have any questions or concerns. Has anyone else received this notice? I'm wondering how long they will honor the 3-out unlimited plans at $17.99. Bookswim, an online rental service for books, is in beta and you can now sign up. Plans start at $19.99 for 3-at-a-time, and go up to $35.99 for 11-out. They claim to have 150,000 titles, and shipping is free in both directions.